The United Nations says there are now three million refugees and migrants from Venezuela who have left the country due to its crumbling economy, violence, hyperinflation and shortage of food and medicines. The figure amounts to around one in 12 of the population. Of the three million, 2.3 million have left Venezuela since 2015, according to United Nations Refugee Agency (UNHCR) spokesman William Spindler who added that the exodus has accelerated in the past six months. “The main increases continue to be reported in Colombia and Peru,” Spindler said on Thursday. More than one million refugees and migrants are in Colombia. Peru has more than half a million, Ecuador over 220,000, Argentina 130,000, Chile over 100,000 and Brazil 85,000, according to the UN. In Colombia, there are around 3,000 arrivals each day, and the Bogota government says four million could be living there by 2021, costing it nearly $9bn. “People go crazy over the caravan of Central Americans entering Mexico, trying to reach the US. That’s four, five, maybe 6,000 migrants, that’s how many we get every four days,” Father Francesco Bortignon, who has given shelter to Venezuelans, told Al Jazeera from Cucuta, Colombia. The World Bank says the crisis has already cost Colombia almost half a percent of its GDP in 2018: $1.2bn. Earlier this year, Ecuador and Peru announced tighter entry rules, with the former declaring a state of emergency in three northern states which receive up to 4,200 Venezuelans daily. 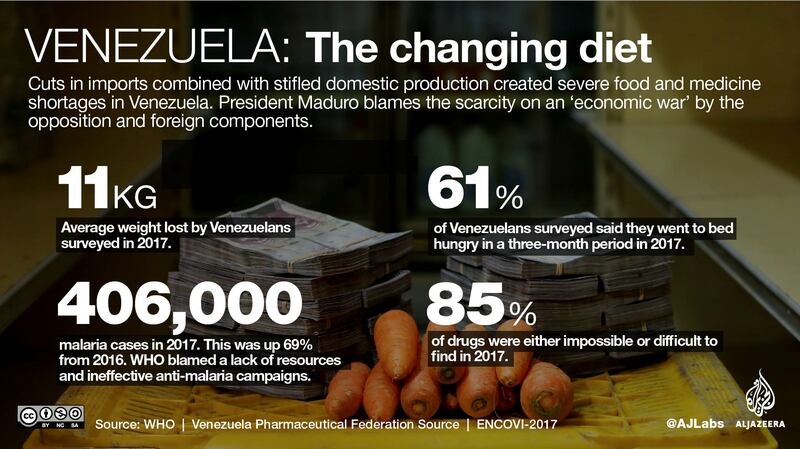 Venezuela is in a fourth straight year of recession, with double-digit declines in its gross domestic product. The inflation rate is expected to reach one million percent this year, according to the International Monetary Fund (IMF). Since 2013, the currency has fallen 99.99 percent against the US dollar on the black market. Under President Nicolas Maduro’s leadership, the industry is operating at only 30 percent, hit hard by the crash in oil prices since 2014 in a country that earns 96 percent of its revenue from crude. Maduro blames the situation on what he calls an “economic war” against his country. Governments initially welcomed the migrants with open arms, remembering Venezuela’s role in welcoming those fleeing dictatorships and conflicts in the past. But the exodus has ballooned this year, stretching social services, creating more competition for low-skilled jobs and stoking fears of unrest. “Countries in Latin America and the Caribbean have largely maintained a commendable open-door policy,” said Eduardo Stein, UNHCR-IOM Joint Special Representative for Refugees and Migrants from Venezuela. Is there hope for peace in Afghanistan?